An international fleet of 470s descended on Enoshima, Japan to race on the waters that will host the Tokyo 2020 Olympic Sailing Competition. 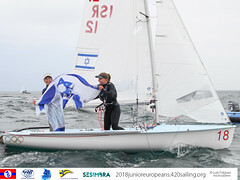 Fifty-seven 470 teams from Australia, China, Great Britain, Hong Kong, Indonesia, Japan, Malaysia, Myanmar, Singapore and Sweden contested the 8 races at Enoshima Olympic Week, 13-16 October 2016. Ryo Imamura/Junpei Hokazono raced a super consisten series, launching their assault with a race win, and never finishing worse than 5th, apart from their discarded 10th place in race 7. 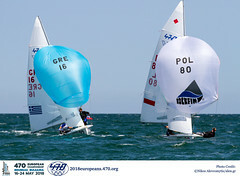 The pair raced at Weymouth and Kiel this summer, with Enoshima marking their first victory together. Tetsuya Isozaki/Akira Takayanagi managed to stay ahead of Sosaku Koizumi/Tomoya Noda by one point, in the all Japanese podium line-up. 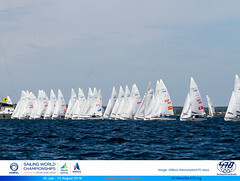 Many young Japanese teams were racing, relishing the chance to race against and learn from the international field. On the final day, Sophie Weguelin/Eilidh Mcintyre (GBR) extended their lead over the two chasing Chinese teams. The last two races were in very light wind, with the Weguelin/Mcintyre partnership showing better boat handling and consistent results. Wang Xiaoli/Lizhu Huang (CHN) had a difficult day scoring a 10,12 to claim second place on tiebreak over Shasha Chen/Haiyan Gao (CHN). Absent from the race track was Japan's multi-Olympian 470 helm Ai Kondo Yoshida, who was busy in Bermuda supporting her husband Yugo Yoshida, who is a member of the Japan SOFTBANK America's Cup team. She will be back racing the 470 soon.